The United States Congress designated the Hermosa Creek Wilderness (map) in 2014 and it now has a total of 37,211 acres. 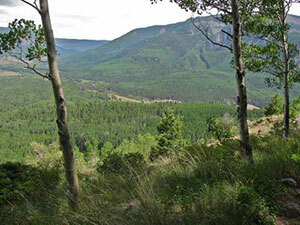 All of this wilderness is located in Colorado and is managed by the Forest Service. Hermosa's crimson-colored red shale and sandstone formation define the landscape as well as it being home to the Colorado cutthroat trout, peregrine falcon and large herds of elk. The mid-elevation wilderness ranges from 7,000 feet to almost 12,000 feet with a diverse forest of old-growth ponderosa pine, Douglas fir, white fir, aspen, blue spruce and Gambel oak. As one of the largest unprotected roadless areas left in the entire Southern Rocky Mountains, the area's spectacular beauty and remoteness attributed to its inclusion into the National Wilderness Preservation System. Thanks to local support from organizations in the four corner region and from citizens all across America, Hermosa Creek Wilderness is now protected for future generations to enjoy as an enduring resource of wilderness. Planning to Visit the Hermosa Creek Wilderness? How to follow the seven standard Leave No Trace principles differs in different parts of the country (desert vs. Rocky Mountains). Click on any of the principles listed below to learn more about how they apply in the Hermosa Creek Wilderness.